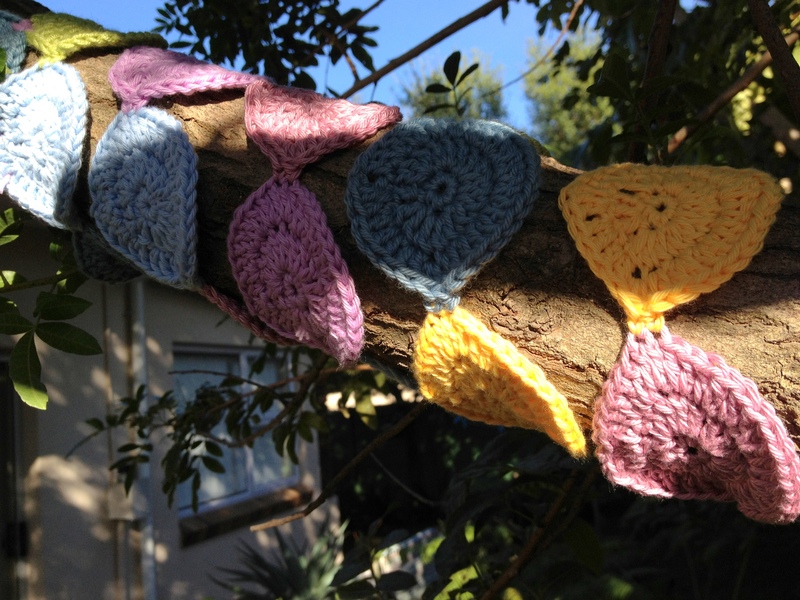 Whilst on holiday in Cape Town, I yarnbombed a tree branch in my mom’s back garden. Why? ‘Cause that what I do! It was a very easy yarnbomb to make. Just a 4 m string of crocheted circles joined together in the join as you go method, and wrapped around the branch. I just had to sew a couple of circles together at the beginning and the end to secure the string, and that’s it! It took only 10 minutes to put up (and about a 2 weeks to crochet all those circles). I really love how it turned out so it was totally worth it. If I had a tree in my back garden I would cover the whole tree this way! I think the pastel colours work well in the shady spot, and my Mom loves it. She looks out onto this tree from the dining room and the kitchen so she sees it every day. If you have a tree and scraps of cotton yarn you should do it too! 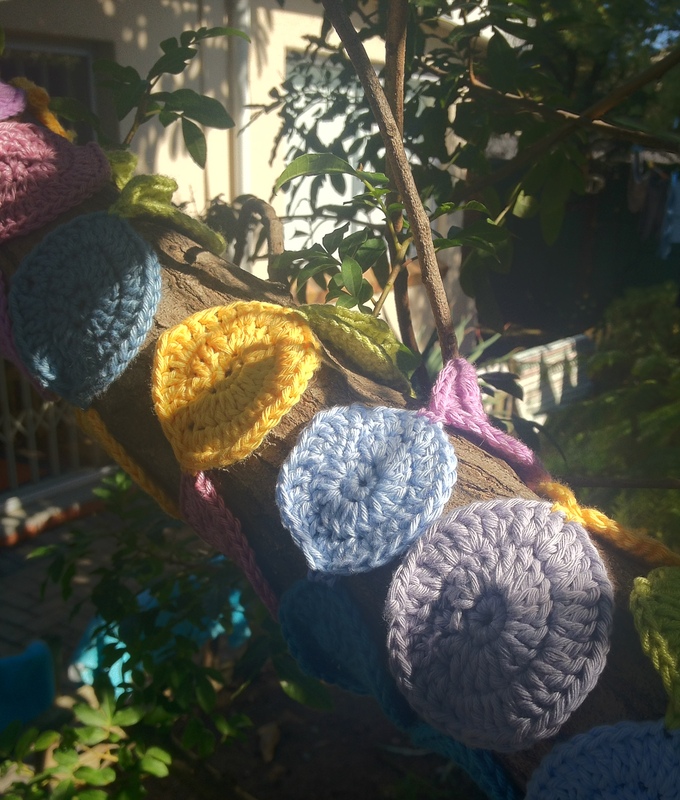 Wrapping a string of crocheted circles around a tree or a branch is a quick and easy way to start yarnbombing. The extra colour will also liven up a bare tree in Winter. Mmmmm… I think I’ve just talked myself into planting a tree in my back garden. 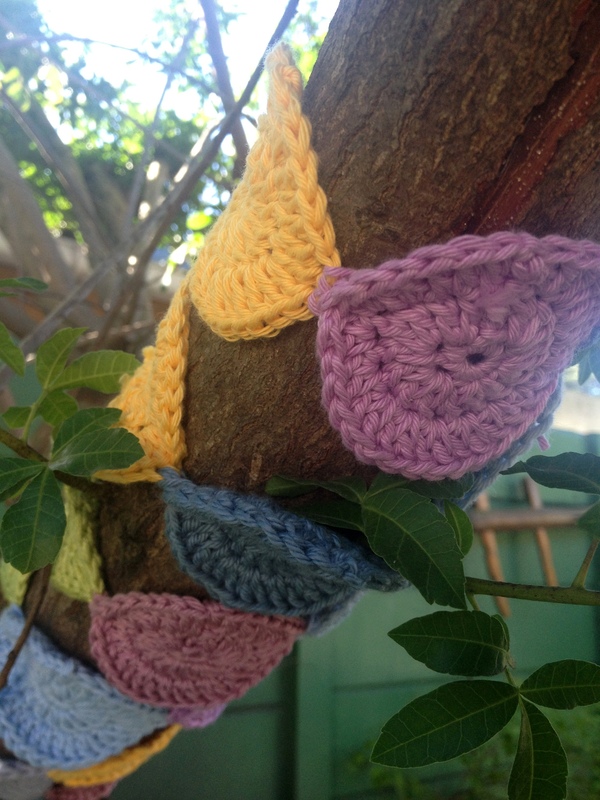 Only a yarnbombing crocheter will plant a tree so that she can decorate it with yarn. Man, I just LOVE this crochet obsession! Or maybe do a small tree in a nice big pot, and start with a “mini-bomb”. You have just given me a great idea 😉 Have fun.